Sprinkle chicken with salt and pepper and place in bottom of slow cooker. In a medium bowl, combine soup and broth and mix well. Add garlic powder and pour mixture over chicken. Cook on LOW for 5 hours or HIGH for 3 hours. Fifteen minutes before end of cook time, remove chicken from the slow cooker. Break softened cream cheese into chunks and add to slow cooker, whisking until the sauce is smooth. Shred chicken if desired and return to slow cooker. Season with additional salt and pepper to taste. Serve chicken over hot rice or egg noodles and top with sauce. It's the simple things like this slow-cooker cream cheese chicken that make life worth living. 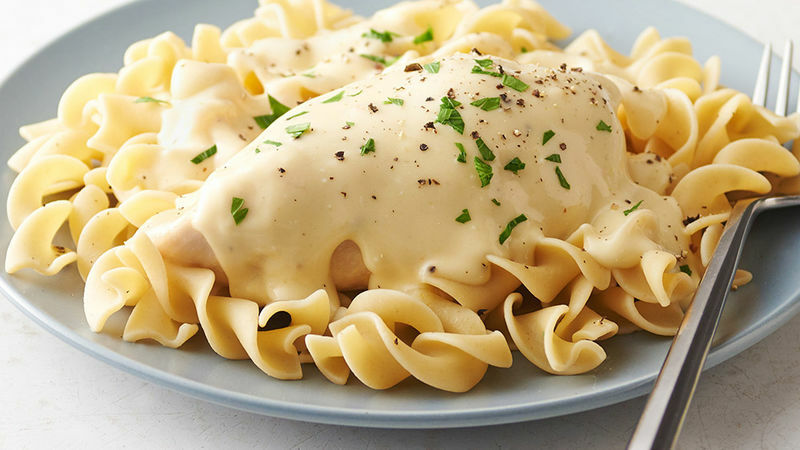 We won't blame you for wanting to pour the easy-to-make rich, creamy cheese sauce included in this recipe all over everything. Pasta? Yes. Mashed potatoes? Absolutely. When choosing which noodles should go in this dish, we suggest going with egg noodles or some other corkscrew-shaped noodle. Why? The grooves in these spiral-shaped noodles are the perfect traps for silky cheese sauce, ensuring maximum cheese quantity in every bite. White rice is also an excellent choice for a hearty pairing. This is one of our favorite chicken recipes, but since you can never have enough chicken dishes, we have tons of recipes just for you.